You can try this burger the next time you want something new and tasty. It really gives the new dimension of taste to your usual beef burger. Cook the toppings in advance for easy use. 1) Melt butter in a frying pan over medium heat. Add white onions. Cook, stirring, for 5 minutes or until softened. Add garlic and sliced mushrooms. Cook, stirring, for 3 to 4 minutes or until softened. 2) Add wine. Bring to the boil. Reduce heat to medium-low. Simmer for 2 to 3 minutes. Stir in cream. Bring to the boil. Simmer for 10 minutes or until reduced by half. Season with salt and pepper. 3) Put the beef patties unto the grill and cook until done. Melt the sliced cheese on top while cooking the patties. 4) Put the cooked patties unto the buns and spoon the mushroom-onion sauce at the top of the patties. Close with the other part of the bun. This looks really good! And yes, O agree with Rochkirstin. This can easily pass as something restos serve! Anyway, thanks for sharing this recipe. Will make sure to whip this up in my kitchen soon. wow!!! I want to try this!!!! Carl: Your recipe is interesting. Since I'm vegetarian I will make meatless version of your food. Is it okay? 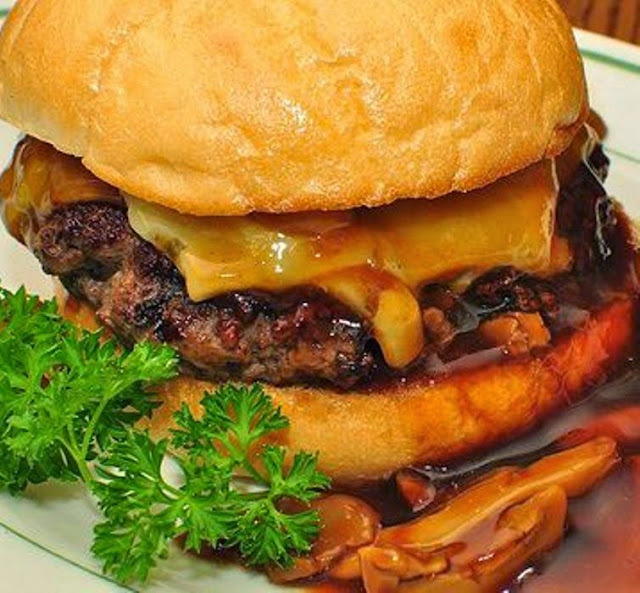 This onion cheeseburger looks so yummy! And it has red wine in it! Unique indeed! Oh my! that photo makes me hungry. I'll try this recipe of yours. Thanks for sharing! Wow! This made me hungry and crave for burgers. Mouthwatering. That's the first thought and impulse I had with your post and it's nice that it comes in big servings. Wow! looks delicious! I'm now craving for burger but I'm lazy to make my own, so I'll call later for a delivery from Mcdo. Gahhhhh! I have a thing for burgers talaga. Even if i don't have the buns, I still keep burger patties in the fridge just in case I crave for burgers.. I will bookmark this site and execute the recipe soon! Yummy, I can have this one less the onion. Hate ko sibuyas eh.